The Food & Drug Administration (United States) on July 20 ordered GlaxoSmithKline the maker of the diabetes drug Avandia to stop recruiting new patients for a controversial clinical trial of this drug that has been found in some studies to raise risk of heart attack & death. The FDA told Glaxo to conduct the clinical trial in 2008 to assess risks of the drug which is indicated to treat diabetics to control blood sugar. But a growing body of evidence has suggested that Avandia increases cardiovacular risk while the drug maker defends the drug saying six trials did not find the drug carries a particularly higher risk. Some FDA veteran safety experts like Dr. David Graham, Dr. Thomas Marciniak & world-famous cardiologist of Cleveland Clinic Dr. Steven Nissen did their studies & found the drug is too risky & its competitor Actos is much safer. Dr. Nissen said it is unethical to give Avandia to diabetes patients while a safer drug is available that offers the same benefits. The FDA order does not ask Glaxo to stop the ongoing trial that has already involved a couple of thousands of patients worldwide. This action drew criticism from consumer advocate groups like Public Citizen. "The FDA has gone only halfway in stopping the unethical study by halting the recruitment of any new patients," Dr. Sidney Wolfe, director of health research at the Washington advocacy group Public Citizen was quoted Boston Globe as saying. "To allow the experiment to continue at all is a major breach in the FDA’s obligation to protect people in clinical trials." 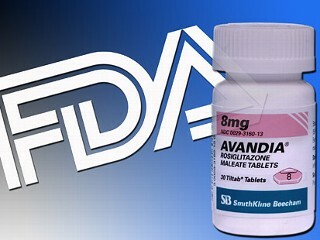 Still, Avandia has its own supporters in and out of the FDA. Last week, the FDA advisory panelists voted 20 to 12 to recommend that the drug be allowed on the market. And some top officials of the FDA did not agree with the opponents of this medication on the safety of the drug either. It is not unknown whether the FDA will make a decision in favor of the drug maker or consumer advocates. A health observer said that people with diabetes should do their homework. Entrusting their lives in the hands of others can be very dangerous. Those who want to take medications like Avandia should know that ACTOS, made by a Japanese drug company is much safer while it delivers similar therapeutic effects.